Invented almost 100 years ago, Butterfinger is the only candy bar to come with its own warning: "Nobody better lay a finger on my Butterfinger." Protect your stash and learn more about the peanut-buttery, $123.9 million-a-year candy. 1. THE NAME WAS SUBMITTED IN A PUBLIC CONTEST. In 1923, Curtiss Candy Company was looking for a name for its new chocolate-covered candy bar with a flaky, peanut butter core and decided to hold a contest to solicit the public for their ideas. Around the same time, sportscasters had started using the term “butterfinger” to describe players who were unable to keep a hold on the ball. A Chicago man who was a self-described klutz submitted the name. 2. BUTTERFINGER'S INVENTOR ALSO CREATED THE BABY RUTH. 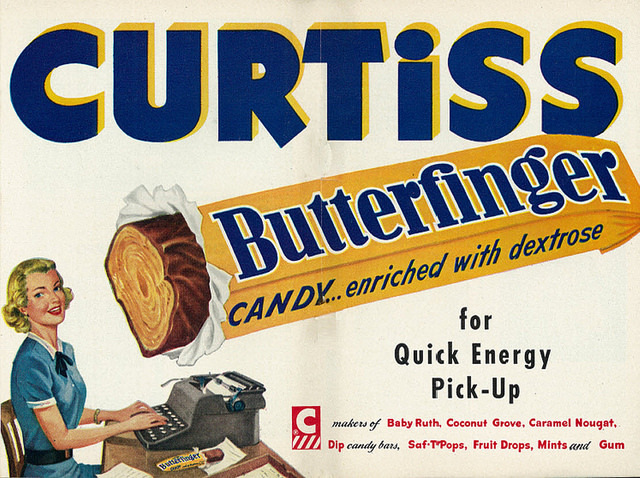 Otto Schnering, the Willy Wonka behind Curtiss Candy, invented the Butterfinger as the follow-up to the popularity of his first candy bar, the Baby Ruth. While bought out by Standard Brands in 1964 (and then sold to Nestle in 1990), Curtiss Candy was once one of the largest competitors in the candy business. 3. THE CURRENT RECIPE ISN'T THE SAME ONE SCHNERING CREATED 100 YEARS AGO. 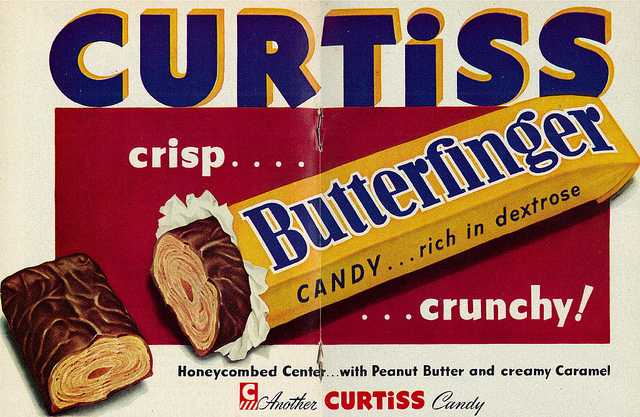 Legend has it when Curtiss Candy was acquired by Nabisco in 1981, the original recipes for both the Butterfinger and the Baby Ruth were lost. However, the candy bar engineers at Nabisco quickly went about creating a similar version. 4. BUTTERFINGER COMMERCIALS WERE THE FIRST TIME MANY PEOPLE SAW THE CHARACTERS WHO WOULD BECOME THE SIMPSONS. Before becoming the hugely popular cultural juggernaut that it is today, The Simpsons started as a series of shorts on the comedy variety series The Tracey Ullman Show. Then Bart, Homer and the rest of the family starred in popular commercials for the candy bar in 1988, a year before the crew from Springfield debuted their own show. So, if you hadn't watched the shorts on Tracey Ullman, it might have looked like some commercial characters scored their own primetime gig. 5. MILHOUSE MADE HIS FIRST APPEARANCE IN A BUTTERFINGER COMMERCIAL. The ad, which aired in 1988, was the second commercial for the candy bar that featured the Simpsons. In it, Bart details the four major food groups to Milhouse (sandwich, cow, jungle and Butterfinger) while Milhouse, in what was just the first of many disappointments for his character, realizes that his lunch doesn't include the coveted candy bar. 6. BUTTERFINGER HAS ALWAYS RELIED ON BIG STUNTS FOR ITS ADVERTISING. In one of its first efforts to make the candy bar more popular, Butterfinger dropped candy bars from airplanes across the country in 1923 (a strategy Curtiss Candy first successfully tried with Baby Ruth). 7. THE COMPANY ONCE MOWED A GIANT QR CODE INTO A KANSAS FIELD. In 2012, in reference to the predicted end of the world by the Mayan calendar, Butterfinger launched its BARmageddon campaign, which included a working QR code mysteriously appearing in a field in Manhattan, Kan. The stunt was accompanied by a press release that detailed stories of Butterfingers going missing from supermarket shelves and solar flares, all of which pointed to the end of days. 8. AND LAUNCHED A NATIONAL APRIL FOOL'S DAY JOKE IN WHICH NEWSPAPERS REPORTED THE CANDY WAS CHANGING ITS NAME TO "THE FINGER." On April 1, 2008, Butterfinger issued a press release detailing its name change and launched a new comedy website. However, it all turned out to be a promotion for the company’s new comedy video network on Yahoo!. 9. AT ONE TIME, YOU COULD PRE-PARTY WITH A BUTTERFINGER. It was called the Butterfinger Buzz, and it contained 80 mg of caffeine—as much as a can of Red Bull. But, low sales (and a probable lack of mixers) led to a short-lived shelf life for the Buzz. 10. 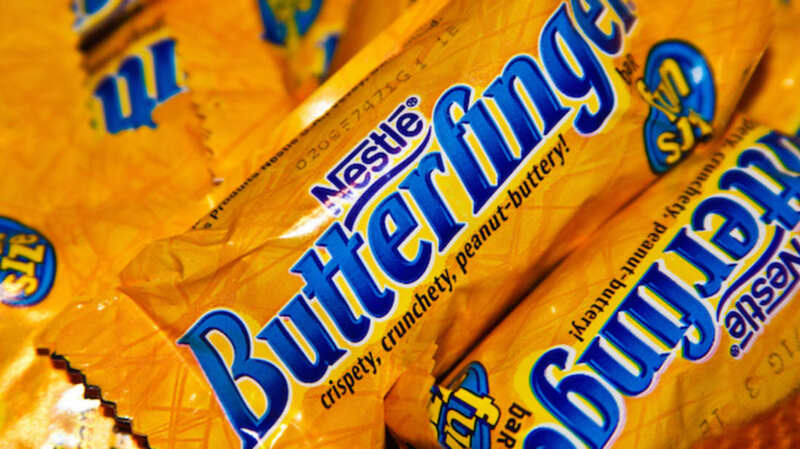 A GREENPEACE CAMPAIGN LED TO THE BANNING OF BUTTERFINGERS IN GERMANY. In 1999, Nestle had its sights set on introducing its line of candy bars to the German market. However, at the time, Butterfingers contained genetically modified corn, which didn’t sit well with activists in the country. Eventually, Nestle chose to abandon German supermarkets instead of changing the ingredients of the candy bar. 11. NESTLE WENT ALL OUT FOR THE LAUNCH OF BUTTERFINGER PEANUT BUTTER CUPS. The cup variation on the classic candy bar was the company’s first new product in five years and had been under development for two years. So Nestle did not hold back when introducing them to the American market and went ahead and bought the company's first-ever Super Bowl ad in 2014. It seems to have paid off, though, as Butterfinger Peanut Butter Cups have attracted some famous fans.